Extreme Craft: A License to Print Munny! A License to Print Munny! 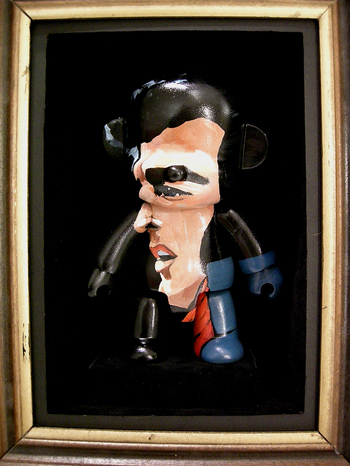 Customized vinyl figures may be the new black, but not many can step to the level of excellence that black velvet artist Tony Shore achieves with his trompe l'oeil Elvis figurine. First, the Munny: Why is KidRobot so darn smart? in addition to making great vinyl figures of their own (and figures for artists like Frank Kozik), they rouse the geek masses by encouraging good old fashioned tinkering, remixing and defacing. Finer stores near you are all climbing over each other to sponsor KidRobot contests that encourage you to repaint a "Munny" figurine. The current Easter Munny contest is being sponsored by Shoparooni in Cleveland. Back to Tony Shore. His chosen medium is....Black Velvet! His paintings would make even the most jaded Tijuana black velvet painter abandon their profitable trade in Elvis and dogs playing poker and move to urban Baltimore, where Shore finds his muse. Shore's paintings exploit the natural beauty of black velvet as a material. Black Velvet is actually BLACKER than paper, paint or canvas ever can be. Shore exploits this by choosing subjects illuminated by porchlights, buglights, lanterns and other unsexy light sources. 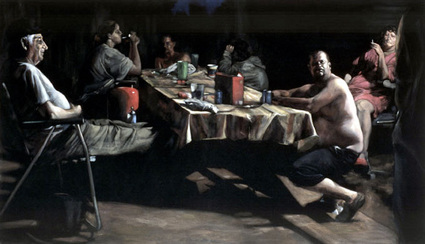 He captures the ambience of hanging out on a summer night on a porch or patio in a muggy place like Baltimore. The paintings don't exactly avoid the kitsch territory of the traditional black velvet painting, but neither does he mine them for his ideas. Instead, Tony Shore makes us take a second look at the possibilities inherent in black velvet....the promise that black velvet holds.